The hit by Sufi rock band Junoon is taken to another level altogether with a Hindustani strain by Rahat Fateh Ali Khan. Ali Azmat’s powerful vocals and guitar element make this composition energetic and sublime. Javed Bashir’s formidable voice with drums by Louis ‘Gumby’ Pinto, redefine fusion music with a daring attempt: Hindustani classical vocals with hard rock. Leaves you spellbound! If you haven’t heard this yet, this song will remind you why Atif Aslam became the phenomenon that he was some time ago. A rendition from his own album, this song is easy on the ears, with soothing accompaniments and hauntingly beautiful backing vocals. Punjabi folk-singer Arif Lohar takes a Sufi favourite Alif Allah (Jugni), retains the earthy flavour and Coke Studio regular Meesha Shafi with lively background vocals makes this song the anthem for every CS fan. This performance makes you wonder why it ever occurred to Pritam to butcher it for Cocktail(2012), and it remains the most viewed Pakistani song of all times on YouTube. Sung by Komal Rizvi and Akhtar Chanal Zahri, Daanah Pah Daanah is a folk song from Balochistan, the sounds reminiscent of shepherds looking after their sheep. This foot-tapping number is fused with universal favourite Damadam Mast Qalandar. Listen with closed captions to really appreciate the incredibly beautiful lyrics! Meesha Shafi returns with the Chakwal group, who are a sensation across Pakistan for this very song. A dhol-accompanied song usually performed at weddings, this rendition is slower, and allows you to appreciate the sheer sublimity of the words! A veritable anthem for Afghans and Tajiks, this Persian chartbuster by pop icon Ahmad Zahir is ably rendered by sisters Zeb and Haniya, who also voiced Sooha Saha from Highway(2014). With a catchy jazz interspersion, it is sure to become a permanent fixture in your playlist! A 14th century composition by Sufi saint Amir Khusro, this Qawwali is performed by two legends: Abida Parveen and Rahat Fateh Ali Khan. This soul-stirring chant will soothe you even if you aren’t very much into classical music. Another folk favourite from Pakistan, this song is given a rock feel by Umair Jaswal with Quratulain Baloch singing the original refrain. Perfect for every time you feel down or unmotivated, you cannot listen to this just once! Iranian sensation Googoosh sang this chartbuster back in the 80’s. 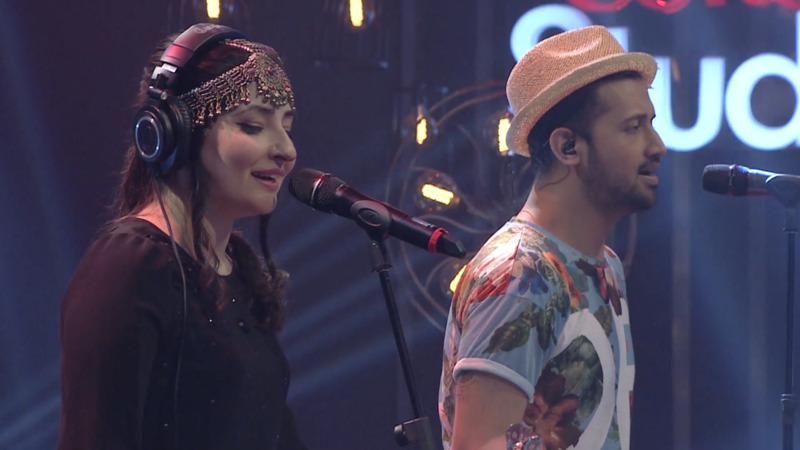 Atif Aslam and Pashto singer Gul Panrra with the traditional rubab accompaniment give this a distinctly Oriental feel. The song is as sweet as the Farsi language in which the lyrics are written, and you will play it on loop enough times to memorise the words! This is only a fraction of the mesmerising performances that Coke Studio Pakistan has to offer. With an astounding variety of songs in languages from Awadhi to the obscure Hindko, CS proves how music, indeed has the ability to transcend boundaries! Which of these are you hooked on to? Let us know in the Comments below!